The version 2.0 for iPhone and iPad is now available. 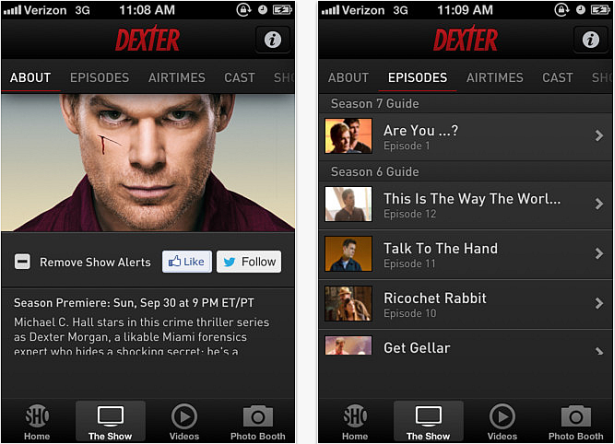 Dexter is renewed, recharged and refocused, and so is the app. Put yourself into a slice of Dexter’s life. Never miss a single thrill by tracking the episode schedule and setting reminders. Watch preview scenes from the next episode, behind the scenes footage and exclusive interviews with the cast and creators. Sample a full episode, download wallpaper and enjoy the Dexter Photo Booth.